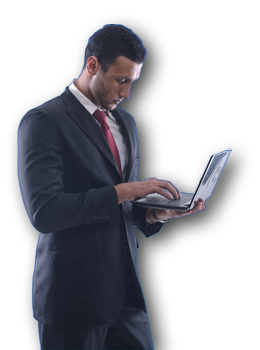 Many of our customers have converted from Desktop Authority to FastTrack. The most common reason is the cost of Desktop Authority. FastTrack costs much less. FastTrack Automation Studio offers most of the same features through an even simpler point and click configuration - but without the need to install, maintain and update a "client" on machines. It's zero touch - nothing needs to be installed on clients and you do not need any extra infrastructure. FastTrack is even simpler than Desktop Authority. No drawbacks. If you would like to talk with us, give us a call at 262-299-4606. 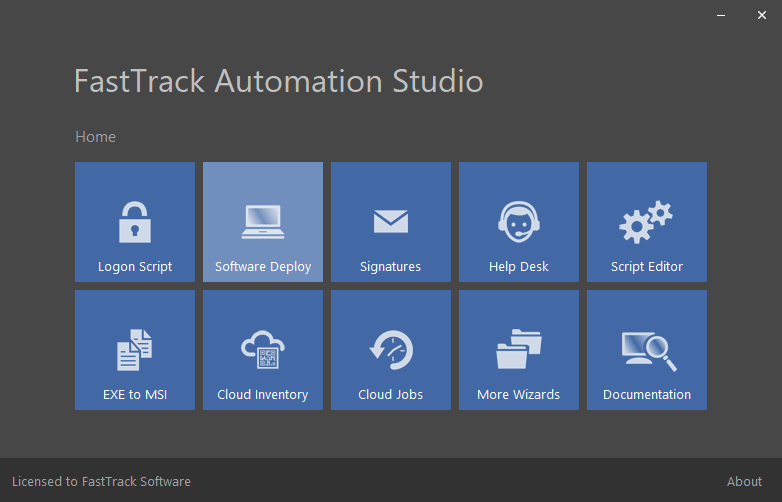 FastTrack Automation Studio costs much times less than DA. 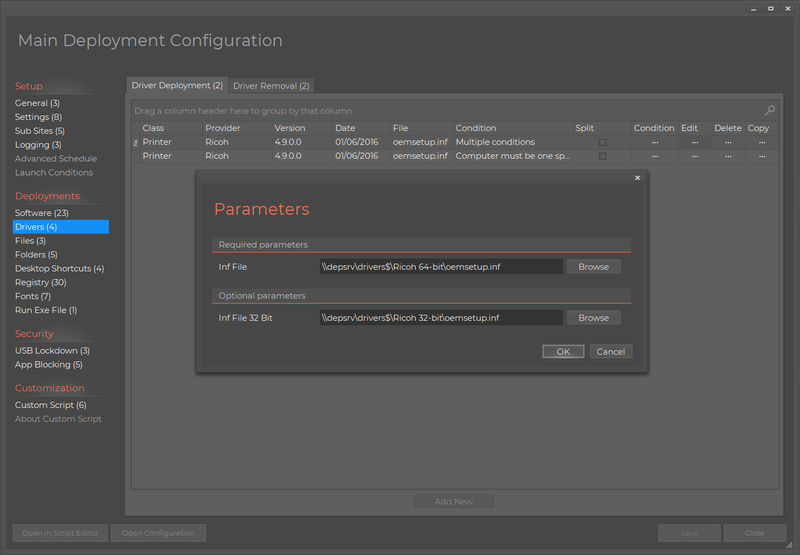 FastTrack Automation Studio is even easier to configure with point and click configuration than DA (see next section). FastTrack Automation Studio does not require you to install and maintain a "client" - you simply use Group Policy to push logon scripts and packages. FastTrack Automation Studio does not require any extra infrastructure at all. Microsoft best practice is to use Group Policy Objects (GPO) as much as possible. 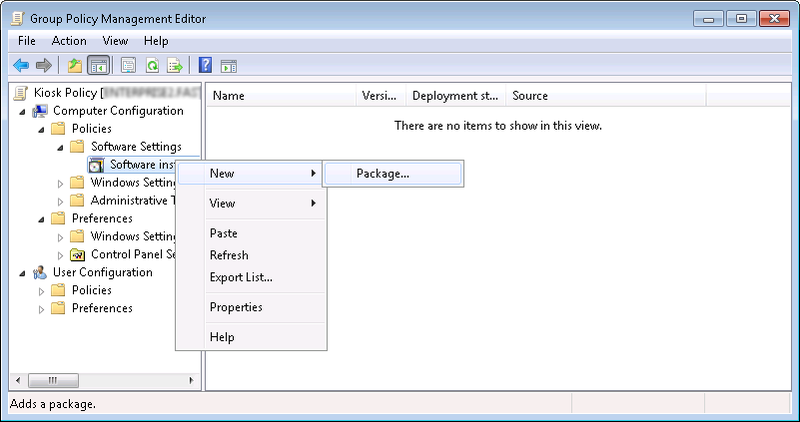 FastTrack Automation Studio builds components to deploy using GPO. This page has three sections. At the bottom, you will find a FAQ to sum up questions from the first two sections. The first section below describes setting up FastTrack Logon for desktop preparation. The second section is Software Deployment to manage software on clients. These two features combined is the DA alternative. But not only is it an alternative - you have lots of features not available in DA and you can remove you DA infrastructure, as we require no other infrastructure than what you already have. Download the fully functional software using the button at the top and see for yourself! Software Deployment - keep it simple! If you have tried to install Desktop Authority or the likes, you know that the first thing which needs to happen, is that you need to install 25-30 components for it to actually work. You need a web server, a sql server database and a heap of other system components. At this time, you are already thinking there are so many things that can go wrong in the production environment. And also, if you just moved your infrastructure to the cloud, what was the point, if you need to install a local management server to distribute software? We have taken a totally different approach, because we believe simplicity is better. There IS no "management server". Instead, all the work happens on the client and all you are seeing in the logs, are in fact clients working for you. 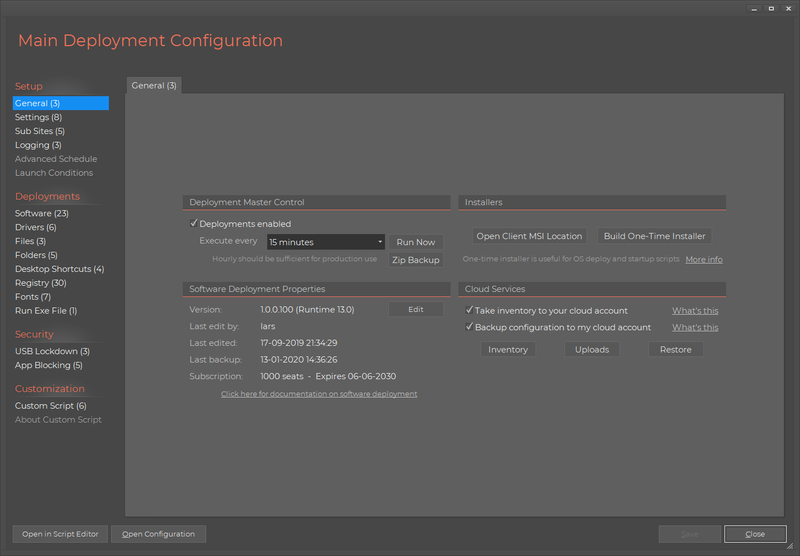 The clever part about our approach is that when you use the software deployment wizard that you see further down, you are not configuring settings in a database. You are in fact building a script for clients based on our core scripting language FastTrack Scripting Host. What is really going on is, when you point and click your way to a configuration setup and save, all you have really done is to write a FastTrack script for clients to execute that you could have written yourself in the Script Editor. Once you edit the configuration, the wizard simply reads this script back into the GUI. If you have added something manually to this script or modified it in a way that the GUI cannot understand, these portions will simply appear under "custom script" in the left menu and nothing is broken. See the software deployment more of a contract than a one-time install job. You have 200 computers and you want to install an MSI package. Maybe 20 have the package already and maybe someone manually removes the software later on 5 computers. The way this works is a recurring comparison of installed software. So in first push, 180 get the package and the last 20 do not error out with the software already installed. If someone removes the package, within minutes, it just comes back. This is much more intelligent and consistent than trying to push one time. So you are basically "just" writing a script that runs recurrently without being directly aware of it. This opens up a whole new world of flexibility. Our core scripting language is the largest in the world and it has a real simple syntax that you can quickly learn. So if you hit the dreaded configuration wall and end up in a place, where the configuration GUI does not suffice, you can just tap down to the "Custom Script" left menu and write a custom snippet. Or you can "take over" script lines built by the GUI and modify to your needs in the Script Editor. If you have trouble doing that, you can write to our support, which is covered by your license, and we can help you. This Farm App Deployment page covers an example of how to manually write the script to install software and unlock all the 1500 commands of the core language. We mentioned Desktop Authority in a previous section. If you have ever used it, you will know that one of the pain points of using it, is updates. When there is a new version, you need to update all clients and often this results in manual service of some of them. This doesn't happen here, because you NEVER need to update the clients. Push it out once using a few Group Policy clicks (explained further down) and you never need to touch clients again. So how can we be sure of that? Simple - the clients don't really do anything. The client MSI installs a scheduled task that synchronizes the FastTrack Scripting host engine fsh.exe and a script file from a network folder and executes the script using this engine exe. If you upgrade FastTrack Automation Studio on your admin computer, the engine FSH.exe will automatically update on the network folder, and therefore in turn on all clients. Our solution is considerably cheaper than common alternatives. And included in licensing, you get the Logon Script Builder that works in the same way to connect shares, printers and install Outlook signatures. You also get a free private cloud inventory and ability to build you own custom MSI files. The first thing you need to do, is to set up a client and distribution point. You do this by clicking "Software Deploy" in the Home Screen and select "Setup New". As said in the first section, this is an extremely thin client. All it does, is to install a Scheduled Task that will kick off a script from your selected network share using the engine fsh.exe and the script from this location. At this time, you need to be sure, where you would want to store the central script to control the operation, as this is fixed in the MSI file. When you get to the next page, you need to enter the credentials of a domain account that is going to perform the operations on the clients. This user does not necessarily have to be a domain admin, but the user has to be local administrator and have full control over the central share location. We recommend that you create an ordinary domain account for the purpose and use a long and complex password, because you have to disable password expiration to avoid having to redeploy the client and put this account in the local administrators group on all clients. Once you have everything in place and you need to install the client on all machines. The easiest way to do that is to use Group Policy. 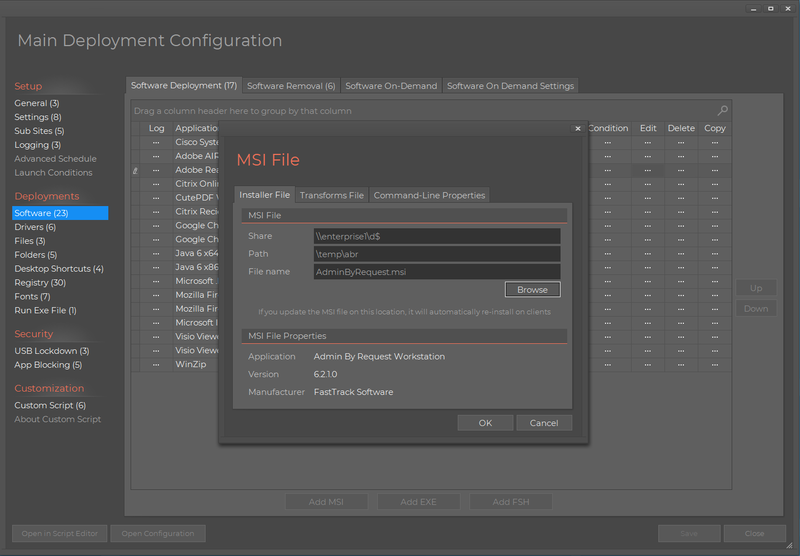 Locate the "Software Installation" policy, as shown below, and browse to the MSI file that you just generated. Group Policy software deployment is not transparent. 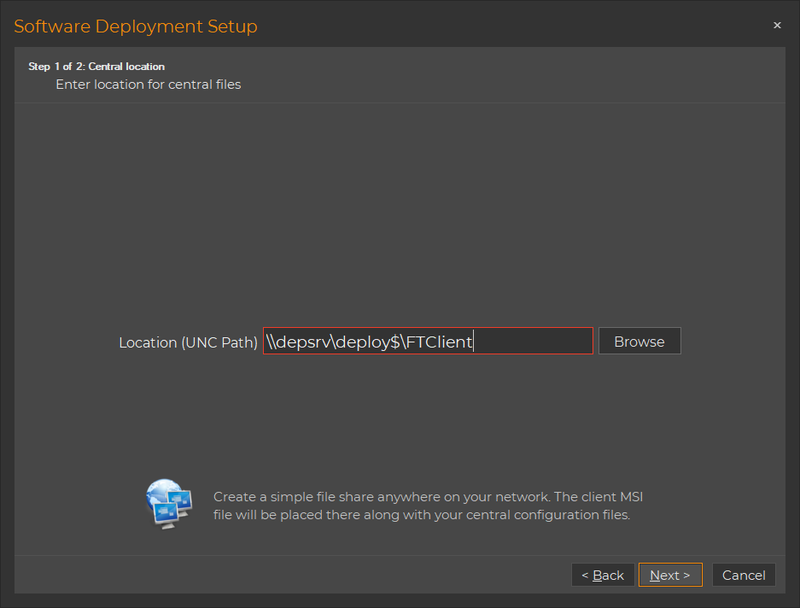 The only way you will know that clients are actually installed, is to open the Home Screen and look at the install log under the "Software Deploy" icon in FastTrack Automation Studio. Once a client Scheduled Task is installed through the MSI file, it will register in the central log. 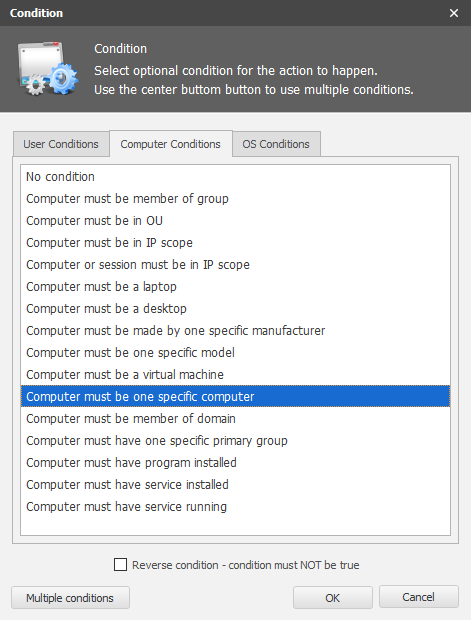 Make sure you are using software installation under "Computer Configuration" and NOT "User Configuration". Also when adding the package to "Software Installation", always use the fully qualified domain name, if you deploy from the netlogon share. In some cases when using the NETBIOS domain name, MSI error 1612 will occur and the package will not install on clients. For example, if your domain is ft.com, use \\ft.com\netlogon\ftclient\ftclient.msi instead of just \\ft\netlogon\ftclient\ftclient.msi. We recommend that you simply use a different share than netlogon. 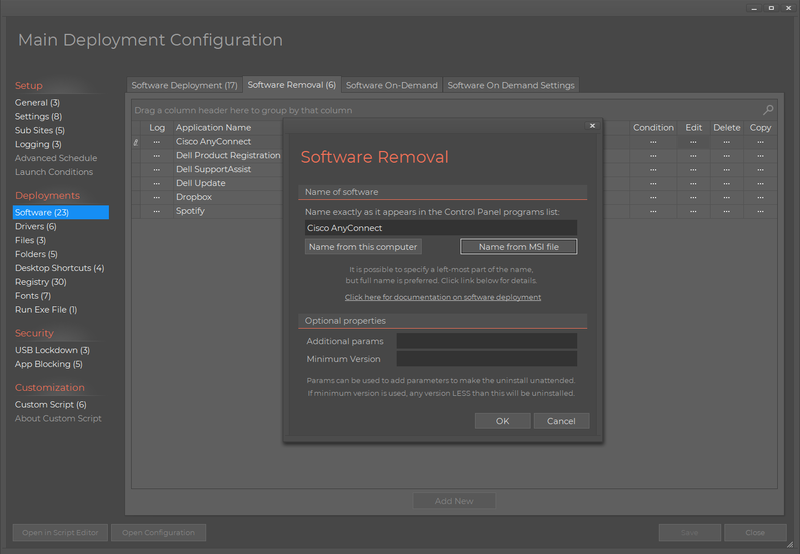 Once you have clients in place, go to the Home Screen and click "Software Deploy" again and select "Edit Configuration". If you are familiar with the Logon Script Wizard, you will recognize the layout. To the left, you see a list of overall feature categories. The first and initial category is the "General" page. Here you decide how often clients check for new configurations and execute the script that you are building with the wizard. For initial construction, 15 minutes is good, but once you are set in a production environment, there is no need for checking for new software, drivers and so forth more than say once a day. The option to generate a "One-Time Installer" (a small exe file) is useful for at least two things. What is does is that it executes the script (the entire configuration) once, when you run the exe file. This way, you could use this exe file as a startup script instead of using the MSI file (which executes recurrently). It is also useful as part of an OS deployment, where you want to make sure that all current software and drivers are installed before the user gets the computer; refer to this page for more information. The only thing you need to be sure of, is that the central location is reachable in the context the exe file runs. For example, a startup script runs as local system account. Under "Settings", you decide a series of settings, such as setting the system time, threshold for minimum free diskspace and policy for laptop software deployments. There is no point in starting an installation of Microsoft Office on a laptop, if there is 10% battery left. On this page, there is also a setting to decide, how many computers may run installations simultaneously. Unless you have a large number of computers and you deploy large packages, it is not necessary to use the simultaneous option. If you wonder how this can work without a central state server, this works by clients sharing an XML state file on the network share, so each client knows how many other clients are installing at the time, when a "slot" is needed. On the "Software Deployment" page you set up software that you would like to install on clients. You simply point to an MSI file on your network using UNC and the GUI will automatically fill in the information. In the case below, we pointed to the Adobe Reader MSI file. Once you click "OK" you will be asked for conditions to install, such as membership of a group or OU. Note that membership and OU here means machine security group and/or OU, as software is machine-wide, not per user. 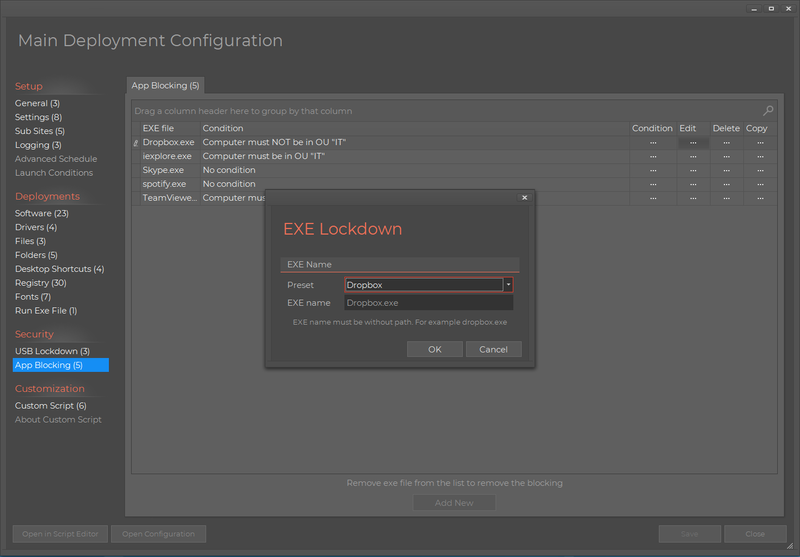 If you select the EXE option, it works the same way, but you have to supply parameters for getting the EXE-based installer to install unattended. If you select the FSH option, you need to point to a FastTrack Scripting Host script that you have built in the Script Editor to install the software. For example, if you use the exe-to-msi feature in the Home Screen to repackage TeamViewer, you might as well fire that FastTrack script directly instead; see TeamViewer page for example. If you use the MSI option, it is NOT a one-time install order. What it does is that when a client executes the script, it will check every time, if the MSI is installed or not, and only install it, if not. The reason why this is important to understand is that it doesn't matter, if some clients already have the software installed, because then nothing happens. It also has two other advantages; one is if the software is uninstalled, it will automatically be re-installed. The other advantage is that you can just update the MSI file on the file server and the version will no longer match = all clients will automatically update to this version, without even operning the wizard again and make a change. The "Software On Demand" feature looks exactly like Software Deployment. The difference is that Software Deployment will push the software out always based on rules, whereas Software On Demand will install a tray icon on client computers, if the list is not empty. When a user invokes the tray icon, a pick list of software will appear. The same rules apply - you can set conditions like user must be member, computer must be a laptop, etc. The menu that will pop up on a computer will be the sum off software in the list that is not already installed and is not rules out from conditions. The "Software Removal" feature works in a similar way. It's extremely simple. Just enter the name of anything as it appears in the Windows Control Panel programs list and it will be uninstalled. You can specify the left-most part, but the full name, as it appears in the Windows Control Panel programs list, must be preferred to ensure that nothing gets uninstalled by accident. On the other hand, some programs like Adobe Reader postfixes the version number in the application name, in which case, this can easily be factored in by using "Adobe Reader" as program name, in which case anything that starts with "Adobe Reader" will be unstalled. Every time the script is executed, it will check the Windows install list for undesired software. In the case below, we do not want users to use Spotify, so we simply add it to the removal list. If the user installs the software, next time the script is executed, it is removed. Today most users are not local administrators, so the removal part is more useful to you for obsolete software. Let's say for example that the Cisco AnyConnect client is no longer used in the company. Then we can just add it to the removal list, and it will be uninstalled on all clients. You can also uninstall software based on version. Let's say all administrators now use TeamViewer 11, then "TeamViewer" can be added as program to remove and "11" can be used as "Minimum Version". In that case, computers with a lesser version than 11, will get TeamViewer uninstalled. The rest of the menus to the left are resonably self-explanatory. Note that some non-MSI based installers do not uninstalled without user interaction. Today this would be true for around 10% of the software out there. In such case, you need to find additional parameter for silent uninstall. A good example is TeamViewer. If it was MSI based, it would uninstall unattended, but it will pop-up an uninstall dialog box. If you Google the subject, you will find that you can pass /S to the uninstaller to bypass it, meaning that you must enter /S in the "Additional Params" for TeamViewer to make it work. On the "Drivers" page, you simply point to an .inf driver file and it will install on clients. It will be installed in the Windows Driver Store and if it fits installed hardware, it will also update current drivers. 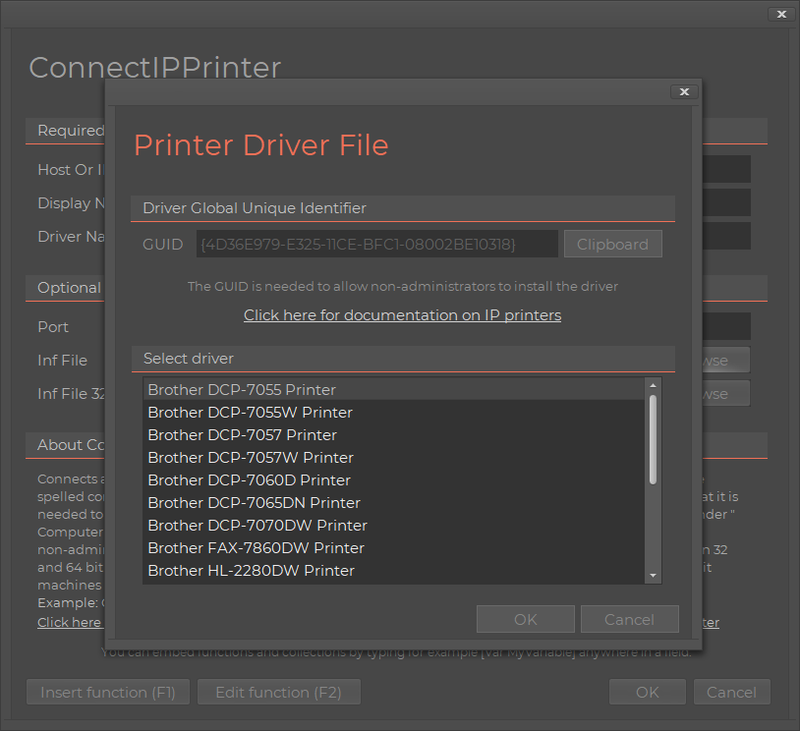 If you want to install or update drivers for say Ricoh printers or general Intel drivers, you simply add the driver(s) to the list and it installs on next execution on each client. The "Split" flag in the list means, if there is a different version for 32 and 64 bit. A common situation would be to preinstall printer drivers. 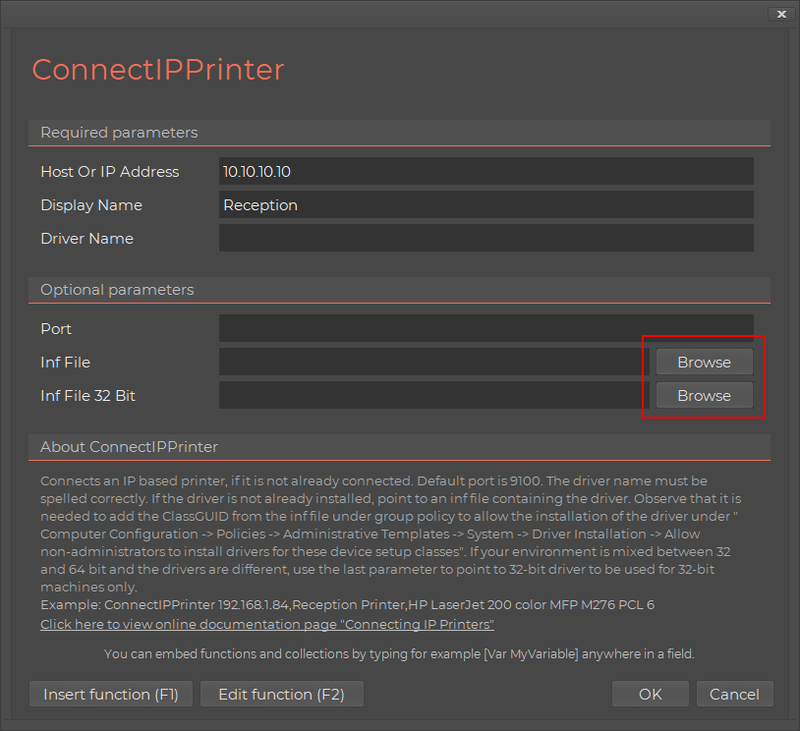 If you use the FastTrack Direct IP Printing feature (click here for more information), it is easier to just preinstall the drivers once this way. You can - as always - add conditions, which makes even more sense with drivers than software. If you want to update for example the Dell power management driver, you would only want to deploy it to Dell computers. It would have no effect installing it on other computers, as the hardware doesn't fit and is therefore not used by the Windows plug'n'play architecture, but there is still no reason it. You can also point to a specific model. For example in the pop-up below, where a driver for Dell XPS 15 computers must be deployed. You can also deploy drivers as part of operating system deployments; refer to this page for more information. 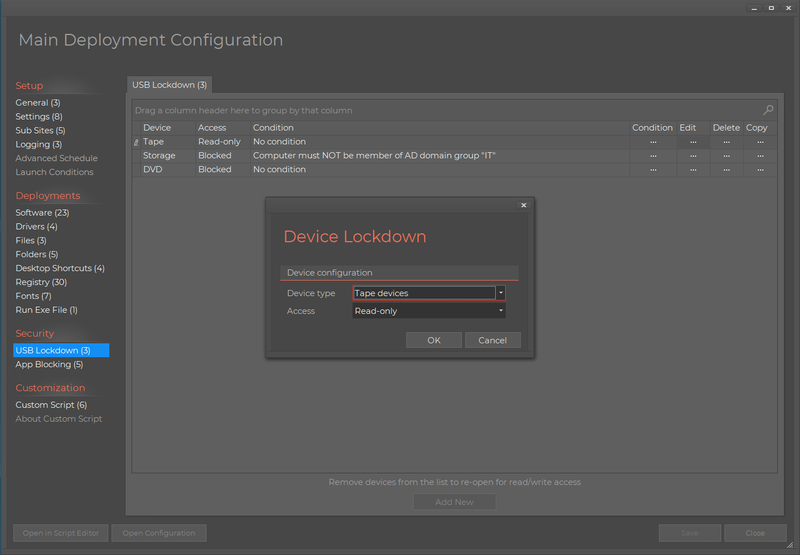 You can also lockdown applications. If you do not want to uninstall an undesired application, you can choose to lock it down instead. For example Spotify or Dropbox. You could uninstall it. Or you can lock it down, in case it is actually needed at a later point. This might be pretty easy to decide for Spotify, but you can lock down anything. You can lock down Internet Explorer or another browser for being used or block starting the OneDrive fat application, to control this via the logon script using drive mapping of OneDrive. In such cases an uninstall is not desirable or in some cases even possible. If there is anything you need to do after successful deployment or removal of software, such as updating an inventory you might have, there are two files named PostInstall.fsh and PostUninstall.fsh in the bin folder on the central location. These kick off every time an installation or uninstallation is successful. This is a normal FastTrack script that you modify in the Script Editor to your needs. The name of the application and the version can be extracted with the functions CurrentInstallName and CurrentInstallVersion. Q: Is FastTrack Automation Studio a complete 1:1 replacement of Desktop Authority? Yes and no. 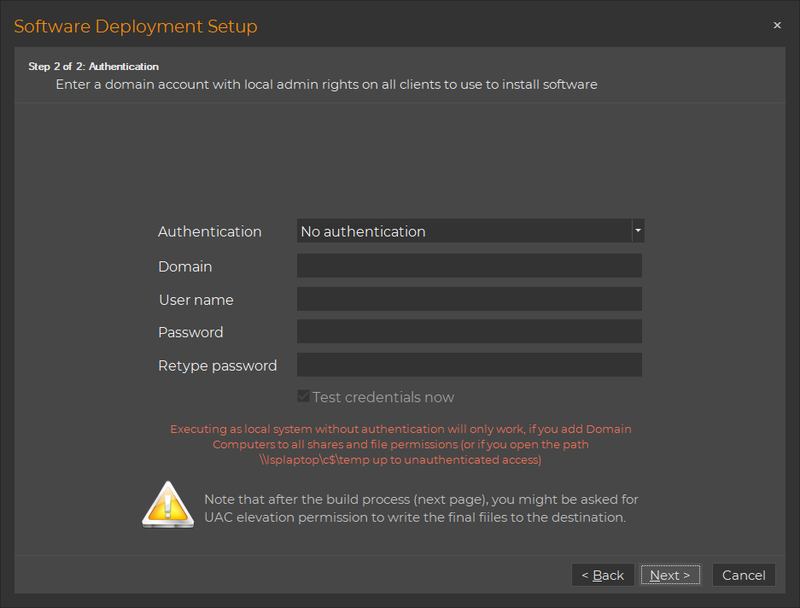 FastTrack Automation Studio was not intended as a replacement of Desktop Authority (DA). It is the largest scripting language in the world and can be used to supplement Group Policies into being a feature match to DA at a much lower price. Microsoft recommends using Group Policies for desktop preparation, but lacks features of DA. These missing features can to a large extend be achieved using FastTrack. The other way around, FastTrack and Group Policies also have many features that DA does not have, such as geographical tracking, laptop backups, travelling users support and exe building. 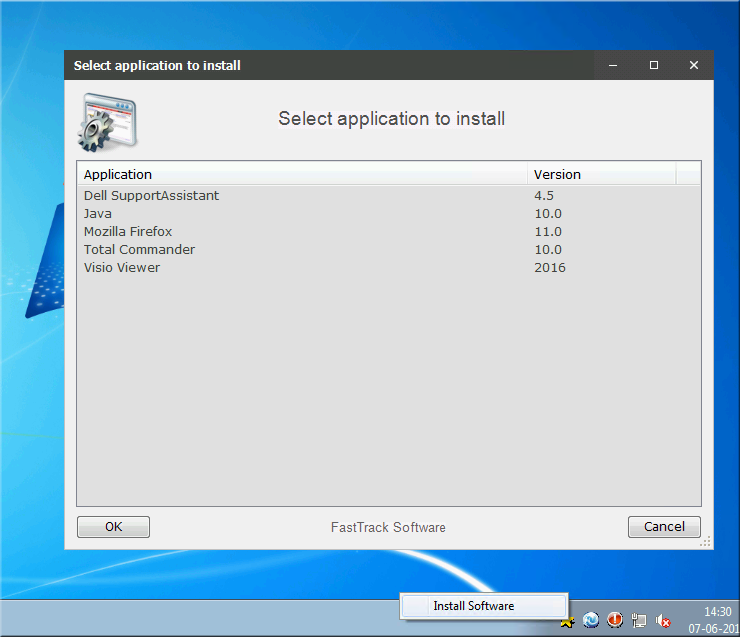 Also, once FastTrack is licensed, you are free to use all the 1400+ commands that FastTrack has that go way beyond just desktop preparation. Q: What are the infrastructure requirements for using FastTrack? None. No local server or deployment of a "client" are needed. All the infrastructure you need is already set up with your Active Directory. 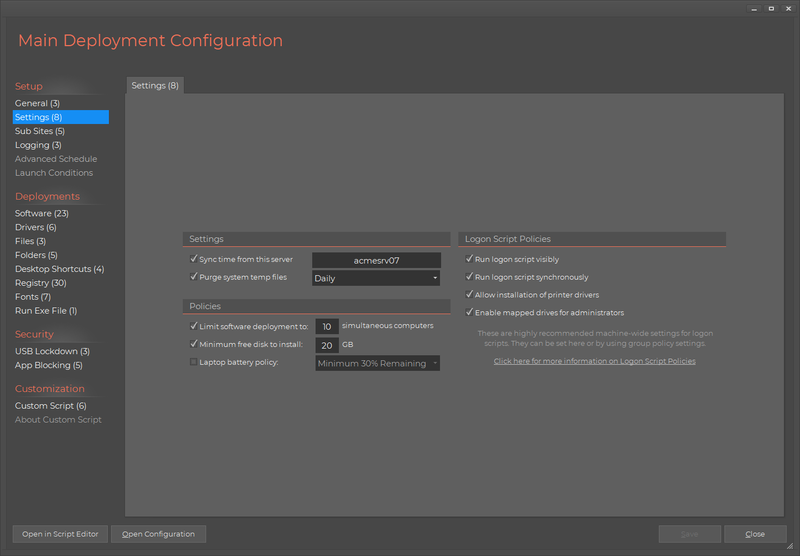 You simply use Group Policies to push a logon script and also to push MSI packages, in case you do not have SCCM or similar. If you need an inventory, a free Cloud Service comes with your license. You can opt to install a local inventory server. Q: How long time does it take to set up? As there are no infrastructure requirements, you simply install FastTrack on an admin machine and start running wizards. That's it. You can have a new logon script running within half an hour. Q: Why would I prefer Group Policies over Desktop Authority? Group Policy does not cover all features or Desktop Authority, but the ones that it does, are much more feature-rich. Secondly, Group Policies is the way Microsoft wants you to enforce policies on your network and the features covered grows with every generation of Windows, giving you less and less value from DA over time. Q: How do I match Validation Logic? You have simple conditions in your logon script to stop execution or have a different execution based on OS version, virtual machines, remote sessions, geographical location and so forth. If you look futher up, you will see this as part of the Logon Script wizard.